BRYAN EATON/Staff photo. 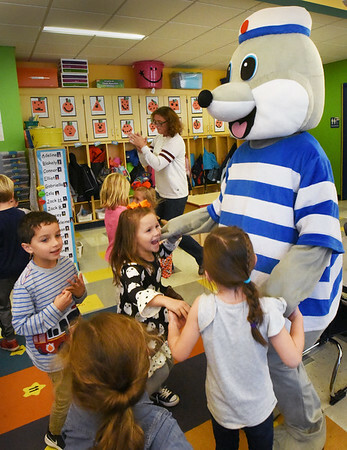 Kindergargtners in Robin O'Malley's class at the Bresnahan School in Newburyport hold hands with the school's mascot Clipper the Seal during a dance party on Friday morning. They were celebrating PBIS (Positive Behavior Intervention Supports) where they earn points for being safe, kind and responsible.